Detail : Official EMI release - 8(b). 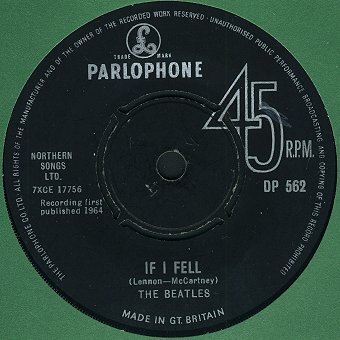 From January 1964 on all their labels EMI now included the words, "Sold in U.K. Subject to resale price conditions. See Price Lists" in the push-out centre. Look above and this one does not, and where is the "R" catalogue number ? The numbering on this is "DP". This release, although pressed in Great Britain, was made ONLY for export purposes. But, the coupling of these two favourite tracks proved irresistible in England and enterprising dealers started shipping them back in FROM abroad. The copy you see above is one of these. Then EMI were not keen to see one of their products sold for more than the standard price, so, they started to press a small quantity for sale in Britain. These copies had the words, "Sold in U.K. Subject to resale price conditions. 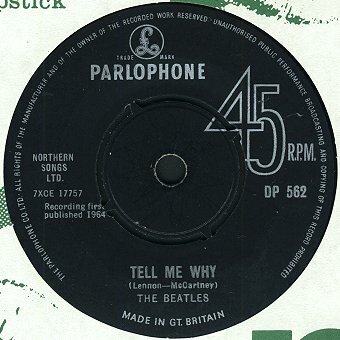 See Price Lists" stamped on them, and therefore logically one could argue that this became an "official" release ... so maybe the Beatles had 23 "official" releases and not 22 as always reported !